Last year, I went on a bit of a quest. For years, as a tabletop gamer who played Warhammer 40K almost exclusively, I subscribed to White Dwarf (or "White Dork" as my late wife used to call it). This is the slick and expensive Games Workshop publication that exclusively covers WH40K and other GW games. But as my ravenous game appetite expanded to wanting to pig out on all manner of miniature, board, RPG, and card games, I began to look for magazines that covered all of these. To my surprise, I discovered that there weren't any. Or, at least, I couldn't find one. There are a number of excellent and beautifully-produced tabletop wargame magazines, such as Wargames Illustrated and Wargames, Soldiers, and Strategy. And there are mags that cover board and family games, such as Casual Game Insider. And then there is GTM, Game Trade Magazine, a magazine targeted at your FLGS ("friendly local game store). But where was the magazine that covers all forms of analog gaming? There's a tabletop gaming revolution going on. So where is the house organ? Here it is. 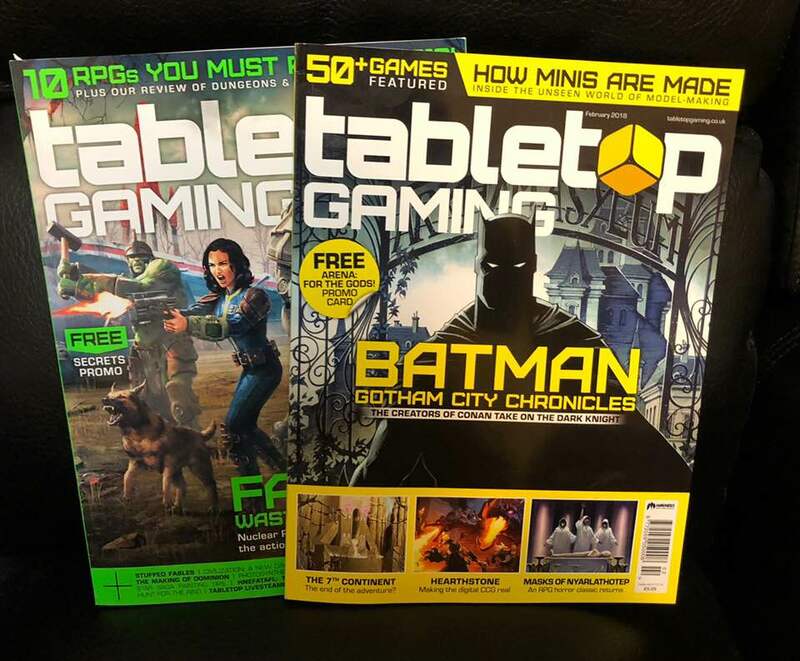 Tabletop Gaming magazine. This very handsome UK-based monthly covers all manner of board games, RPGs, card games, historical wargames, miniature games, dice games, party games, you name it. I didn't even have high expectations for the contents of such a magazine, but Tabletop Gaming delivers a very well-designed and well-written publication that examines every aspect of the gaming hobby. Feature articles cover new games being developed, aspects of game history, culture, art, design, the gaming industry, even the psychology and science of gaming. There are interviews with game designers, peeks at historical games of yore, instructional articles for game design wannabes, even hobby articles on painting miniatures, building terrain, and the like. And, as you would expect from a gaming magazine, there are loads of thoughtful reviews of the latest and greatest games in each issue. I have read the last two issues nearly cover-to-cover. Here is some of what was inside: (January, 2018) A deep dive into the forthcoming Fallout miniatures game, 10 RPGs to play in 2018, the making of Dominion, a look at Stuffed Fables, a new storybook game from Jerry Hawthorne, designer of Mice & Mystics, a look inside the counterfeit game market, and an article on Hnefatafl ("neffa-taffle") an ancient Viking board game. (February, 2018) A detailed look at Batman: Gotham City Chronicles, the hotly anticipated miniatures board game by the creators of the Conan tabletop game, a piece on how gaming miniatures are made, what is in store for the return of Masks of Nyarlathotep, arguably one of the greatest RPG adventures ever written, and finally, a guide to painting up the miniatures for the Star Trek Adventures RPG. Every issue also comes with a free promo card for a popular new game. You can sometimes sell these on eBay to help defray the cost of your subscription. That subscription doesn't come cheap, by the way. A 12-issue print sub, sent to the US, is £120. An annual digital sub is half that. But you can also likely pick up a copy at your FLGS. If they don't carry it, encourage them to do so. I personally am happy to pay such a price for a magazine this good that covers all of the gaming itches that I want to scratch.